In this study the observed non-linearity in the spatial pattern and time evolution of El Niño Southern Oscillation (ENSO) events is analyzed. It is shown that ENSO skewness is not only a characteristic of the amplitude of events (El Niños being stronger than La Niñas) but also of the spatial pattern and time evolution. It is demonstrated that these non-linearities can be related to the non-linear response of the zonal winds to sea surface temperature (SST) anomalies. It is shown in observations as well as in coupled model simulations that significant differences in the spatial pattern between positive (El Niño) versus negative (La Niña) and strong versus weak events exist, which is mostly describing the difference between central and east Pacific events. Central Pacific events tend to be weak El Niño or strong La Niña events. In turn east Pacific events tend to be strong El Niño or weak La Niña events. A rotation of the two leading empirical orthogonal function modes illustrates that for both El Niño and La Niña extreme events are more likely than expected from a normal distribution. The Bjerknes feedbacks and time evolution of strong ENSO events in observations as well as in coupled model simulations also show strong asymmetries, with strong El Niños being forced more strongly by zonal wind than by thermocline depth anomalies and are followed by La Niña events. In turn strong La Niña events are preceded by El Niño events and are more strongly forced by thermocline depth anomalies than by wind anomalies. Further, the zonal wind response to sea surface temperature anomalies during strong El Niño events is stronger and shifted to the east relative to strong La Niña events, supporting the eastward shifted El Niño pattern and the asymmetric time evolution. Based on the simplified hybrid coupled RECHOZ model of ENSO it can be shown that the non-linear zonal wind response to SST anomalies causes the asymmetric forcings of ENSO events. This also implies that strong El Niños are mostly wind driven and less predictable and strong La Niñas are mostly thermocline depth driven and better predictable, which is demonstrated by a set of 100 perfect model forecast ensembles. We like to thank Harry Hendon, Neville Nicholls and Yuko Okumura for fruitful discussions and comments. We also like to thank two anonymous referees for their comments. 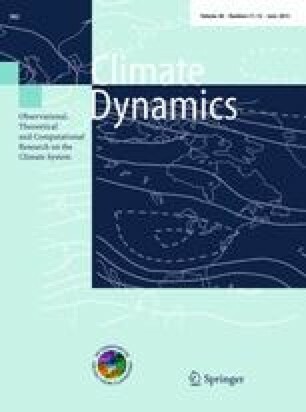 This study was supported by the ARC Centre of Excellence in Climate System Science (CE110001028), the ARC project “Beyond the linear dynamics of the El Nino Southern Oscillation” (DP120101442) and the Deutsche Forschung Gemeinschaft (DO1038/5-1).